We know you put a lot of trust in our app. More than 500,000 teams trust TeamSnap to keep records on more than 8 million team members safe. And believe me when we say we take this trust seriously, especially in this era when almost every week brings reports of a new major company being breached and millions more customers put at risk. The ugly truth is that every company doing business online is a target, and when you’re a market leader like TeamSnap, you’re an attractive target. So we’re quite happy (and relieved) to say that we’ve never been the victim of such a breach, and we intend to keep things that way with our two latest security improvements. We’re taking a major step forward in this area by securing our entire app with Transport Layer Security (TLS), the modern standard for security on the web. TLS replaces the old SSL standard, which you’ll probably remember came under attack in last year’s “Heartbleed” incident. When you see the lock in your browser’s address bar, you’re dealing with a secure site, and now you’ll see it everywhere on TeamSnap. We did have TLS on certain sensitive pages before, but now we’re extending this protection to every page. 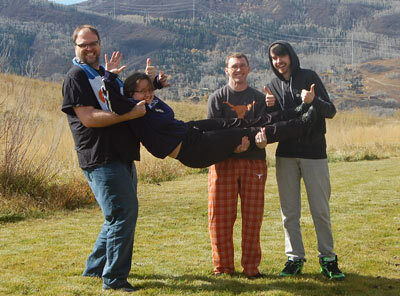 The TeamSnap Ops Team: Making TeamSnap safer, even in pajamas in the mountains. And we’ve taken this one step further by using Extended Validation (EV) certificates, the same level of security used by major financial institutions and Fortune 500 companies. When you visit www.teamsnap.com or go.teamsnap.com, you’ll see a green “TeamSnap, Inc.” indicator in addition to the lock. The EV certificate process requires a careful audit of a company’s identity, and we’re proud to say we’ve passed. That green indicator, shown only for EV certificates, is your assurance that you’re working with the one and only TeamSnap. Accept no substitutes! If you’re on any page on our websites and don’t see the lock or green EV indicator, contact our support department (support at teamsnap.com) and let us know. Maybe it’s a serious problem, or maybe it’s just a page we need to re-check; either way, we’ll help you understand what’s going on and get things fixed. We’re continuing to work each and every day to make TeamSnap your trusted, secure and easy-to-use team and group management app. Thanks for continuing to trust us with your team. We’re proud of that trust, we’ll never take it for granted, and we’ll do our best to keep it. Mark leads the systems operations group at TeamSnap. If the Internet is a series of pipes, ops are the plumbers; if Mark’s doing his job right, you don’t think about the pipes, but when the pipes burst and there’s a mess on the floor, he’s there to make things right. Mark currently lives in Greenbelt, Maryland; with his wife Jennifer, a former softball pitcher; his stepdaughter Julia, a talented circus performer and gymnast; and his dog Archie, who serves TeamSnap in the Operations Security K-9 Unit (by which we mean he barks loudly at the mailman when he approaches Mark’s home office).